The success of California’s “Three Strikes and You’re Out” (Three Strikes) law is reflected in over a decade’s worth of crime statistics. Despite the facts, critics vocally assert that the law has been a failure. A common refrain is that the law has led to an explosion in prison population, fueled by the incarceration of thousands of undeserving repeat felons. Another is that Three Strikes has filled our prisons with low-level felons, and drug addicts. This document is a summary of a broader report – California, Crime, Prison Population, and “Three Strikes” – which compares some of the myths about Three Strikes with facts reflected in California’s crime statistics. The report explores trends in California’s prison growth, versus what was projected before and after Three Strikes. It compares California’s prison population and crime rate to other states, and weighs whether increased penalties have an effect on crime rates. It also breaks down our prison population to show that the vast majority are in for serious or violent crimes, crimes against the person, or crimes aggravated by prior felony convictions. The report also shows the impact Three Strikes has had on two classes of property crimes, residential burglary and auto theft. In early 1994 the Legislative Analyst’s Office (LAO) estimated that “By the year 2003 the additional costs [associated with the passage of Three Strikes] will reach about $3 billion and will grow to about $6 billion by the year 2026. These amounts assume that the changes will add about 270,000 more inmates to the state’s prison population than would have occurred,” (Source: Legislative Analyst Ballot Argument, 1994). The Three Strikes initiative passed with 72% support on the November 1994 ballot. A recent LAO report acknowledges that the explosion in prison population they and others predicted was simply wrong, stating that “1994 analysts predicted that Three Strikes would result in over 100,000 additional inmates in state prison by 2003. Clearly that rate of growth has not occurred,” (http://www.lao.ca.gov/2005/3_Strikes/3_strikes_102005.pdf Page 15). The actual growth in California’s prison population has been modest when compared with the 190% growth experienced during the ten years prior to the adoption of Three Strikes [see chart on page 2]. 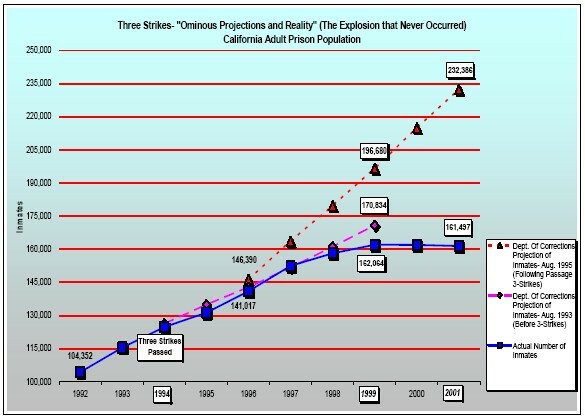 In 1995, the California Department of Corrections also predicted an explosion in prison population resulting from Three Strikes that would top out at close to 235,000 inmates in 2001. 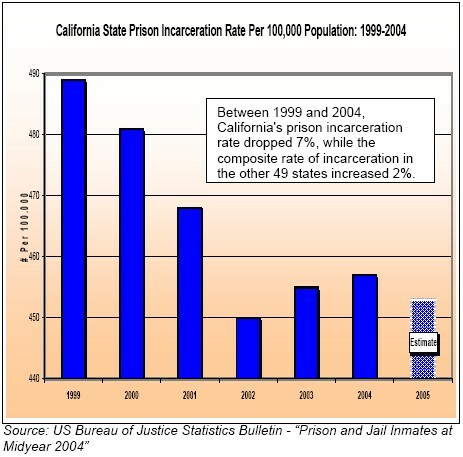 On June 30, 2001, California’s inmate population was 161,497 – 70,000 inmates fewer than projected by Corrections. In fact, California’s population growth slowed to nearly a halt within 5 years of the passage of Three Strikes, and grew by less than 1% between 1999 and 2004. Because of misinformation disseminated by opponents of the criminal justice system, few in the public know that at least 15 states have a greater incarceration rate than California (per 100,000 population). In the ten years following the adoption of Three Strikes, California’s incarceration rate grew more slowly than the composite rate of incarceration for the other 49 states. Between 1994 and 2004, the national increase in state prison inmate population was 10% higher than in California alone. During these years, California’s incarceration rate actually decreased 7%, while the average rate for the other 49 states increased 2%. 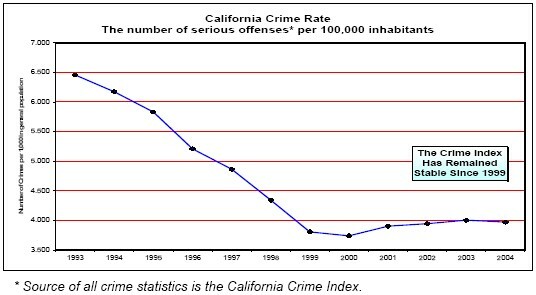 California’s total crime rate in 1993, the year prior to adoption of Three Strikes, was fourth highest among all states. By 1999, California’s total crime rate dropped to 29th among the states. During the same period, California’s homicide rate dropped from fourth highest to 19th among the states. These statistics clearly suggest that California’s falling crime rate was not just part of a national trend, or a result of demographics or economic factors – as opponents have suggested. Additionally, California’s incarceration rate would fall below the average for all states were it not for the number of criminal alien inmates housed in its facilities. In 2003, 18% of California’s entire prison population (30,200) were classified as criminal alien inmates by the Federal Government Accountability Office. In 1994, the Three Strikes initiative designated burglary as eligible for a strike. In the ten years since, the incidence of vehicle theft (which is not a strike) surpassed burglary on the California Crime Index for the first time. Between 1999 and 2004, the number of vehicle thefts in California increased by 83,000, four times the increase in burglaries during the same period. California’s rate of vehicle theft has increased dramatically relative to burglary in large part because burglary is a strike offense with corresponding penalties, while vehicle theft is not. Currently, at least 23 states have some sort of Three Strikes sentencing law with 10 states adopting statutes in 1995, the year after voters approved California’s Prop 184. Not surprisingly, these states have also experienced reductions in crime.